4Videosoft DVD to iPhone Suite for Mac is packed with DVD to iPhone Converter for Mac and iPhone Video Converter for Mac. You can convert DVD movies to popular iPhone MP4, MOV and M4V. It enables you to general videos to iPhone videos as you like. This Mac DVD to iPhone Suite gives you splendid editing functions to optimize the output videos. 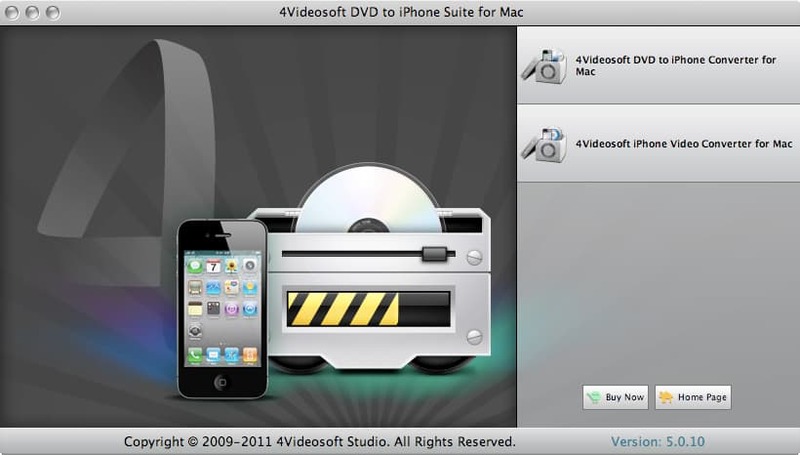 4Videosoft DVD to iPhone Suite for Mac enables you to convert DVD movies to popular iPhone MP4, MOV and M4V. You are able to enjoy the output videos on your iPhone 5S, iPhone 5C, iPhone 5, iPad 4, iPad air, iPod touch and iPod nano and so on. The powerful software can also convert popular videos like WMV, AVI, FLV, MTS, etc. to iPhone MP4/MOV/M4V. These output videos can play on your iPhone, iPad, iPod and Apple TV and so on. The DVD to iPhone Suite for Mac enables you to extract audio files and convert them to iPhone MP3, M4A, AAC, AIFF and WAV. 4Videosoft DVD to iPhone Suite for Mac provides you with the professional editing functions like effect, trim, crop, watermark and more. With them, you can modify video effect by adjusting brightness, contrast, saturation, hue and volume. You are allowed to reset the video length and cut off the black edge. It can help you add your favorite text and image watermark. In addition, you are able to merge several videos into one. This program allows you to finish your conversion within several clicks, and you are able to convert your videos in batch. You can preview the source video and take snapshot. Now the program adopts new kernel so that you can finish your conversion with the best speed and quality. 4Videosoft DVD to iPod Converter for Mac (Popularity: ) : 4Videosoft DVD to iPod Converter for Mac is especially designed for iPod users to convert DVD to iPod, iPod Nano, iPod Touch, iPod Classic MP4, MOV video and MP3, AAC, AIFF, M4A audio on Mac. Another way to use fields for databases (Popularity: ) : Another way to use fields for databases script is a lightweight method to access the field names from a database. Euler angles to Quaternion Conversion (for six basic sequence of rotations) (Popularity: ) : Euler Angles To Quaternion Conversion for six basic sequence of rotations around X(Roll),Y(Pitch) and Z(Yaw) axis.Allowed Sequences: xyz, xzy, yxz, yzx, zxy, zyx.